I Buy Way Too Many Records Dot Com: Plow United - Everything 7"
I was pretty psyched to open up a package that was addressed to this website and find that it contained the new Plow United 7". I've said it before, but I'll repeat it again: I always am appreciative of an label that sends me something to review, but if you send me a record by a band I already like that's worth some bonus points. 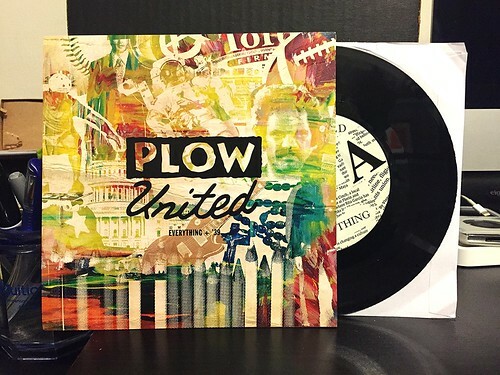 I've been listening to Plow United for twenty some odd years at this point and they still manage to the create these anthems that make me want to ball up my fist and shout along. "Everything" is a perfect example of this and is also going to be on the band's upcoming full length. The verse builds off of rapid fire vocals describing different ideologies and beliefs until the chorus kicks in to explain that "I've been everything." With this being Plow United, be sure that the chorus is delivered in the catchiest and most triumphant way possible. Exclusive to this 7" is the B side "'39." It's a Queen cover from the Night At The Opera album, though you may not pick up on that listening to Plow's version. Clocking in at an economical one minute and fifty-three seconds, Plow turns this into a fast paced, slightly country tinged interpretation. If I have one complaint, it's that it seems to fly by too quick, but both songs do a great job of whetting my appetite for the new Plow United full length. Expect a review of that in the next few weeks as well.